How Did These Graduate Students Improve Their Working Conditions? They Went on Strike! At the University of Oregon, campus organizing took on a new meaning when graduate workers went on the picket line. On their campus set amid the idyllic northwestern woodlands, graduate students at the University of Oregon stepped out of their classrooms and onto a historic picket line last week. The union, representing some 1,500 graduate teaching fellows, went on an eight-day strike and emerged Wednesday with a final deal, embattled but triumphant. The agreement, now set for a final vote, fell somewhat short of their central request for paid family and medical leave. Instead, the university will establish a “hardship fund” to support graduate students who need time off to tend to healthcare needs, including students who are not employees or union members. From a fund of about $150,000 ($50 per graduate student), students will apply for grants “up to $1,000 in the case of serious medical issues and $1,500 in the case of the birth, adoption or foster care placement of a child.” The union also got a 10 percent wage hike over two years. These benefits clearly provide just emergency supplemental support, but will make life a little easier for the graduate fellows, who teach about one-third of the university’s coursework while juggling their studies and caregiving duties. According to the GTFF, their gross annual income ranges from $12,000 to $19,000—in line with national compensation trends for student instructors. They’re part of an overall shift in academic labor toward lower-paid graduate student and adjunct teachers who lack the salaries and benefits afforded to established professors. For young academics stretched between intense academic pressures, massive student debts and wages that put doctoral candidates on food stamps, benefits like paid leave may be the only financial buffer against a sudden illness or family medical emergency. The union ultimately secured a hardship fund arrangement that would be overseen by a seven-member panel, which must have a majority of graduate students. GTFF organizer Amber Cooper explained via e-mail that the funding structure originally proposed by the administration had been inadequate, but “what we won by going on strike is that we have a majority of the spots running the fund, and guarantees put in place that the fund can’t be seriously altered to result in people getting turned away and not being able to take leave.” In addition, students can raise complaints and call for third-party binding arbitration if the grant process is mishandled or the funding is unfairly reduced. But the final deal still has some weaknesses, including the fact that the fund “can run out. With real paid leave the employer can’t turn people away who need leave and qualify (have baby or are sick).” If more money is needed, a labor-management meeting will be required to address students’ unmet needs. But at the end of the day (concluding with a twenty-two-hour mediation), the union leadership called the deal “progress in a national movement to strengthen the rights of workers to protected time off work.” The success emerged not just through the negotiation process but through the direct actions surrounding it—the university’s first such strike in about thirty-eight years—which illustrated how much is at stake in today’s campus labor battles. The university also issued a memorandum suggesting to international graduate students that their visa status might be jeopardized, prompting accusations from the GTFF that the university was insidiously threatening strikers with deportation. With the hardship fund won, graduate teaching fellows see other labor issues ahead. Aside from graduate workers, the university still does not provide such benefits to adjunct instructors. Paid leave-time legislation has been proposed by state lawmakers as well. Meanwhile, graduate workers continue to confront labor issues affecting all higher-education institutions—salaries that often amount to less than minimum wage, massive student debts and shaky future prospects in a hyper-competitive, precarious academic labor market. And in the background, public education investments have dwindled, and colleges increasingly marketize campuses as businesses rather than intellectual communities. And their colleagues on other campuses are just starting to claim a place at the bargaining table. The freshly minted graduate student unions at Columbia and New York Universities are building new labor and political communities at private universities, which have historically resisted academic unions, unlike many public institutions like University of Oregon. Campus activism is more subdued today than in the 1960s, but graduate workers are organizing on a new economic landscape, spurred by a sense that elite academic professions are in many ways just as precarious as any service job—and their struggles demand a strong labor movement. 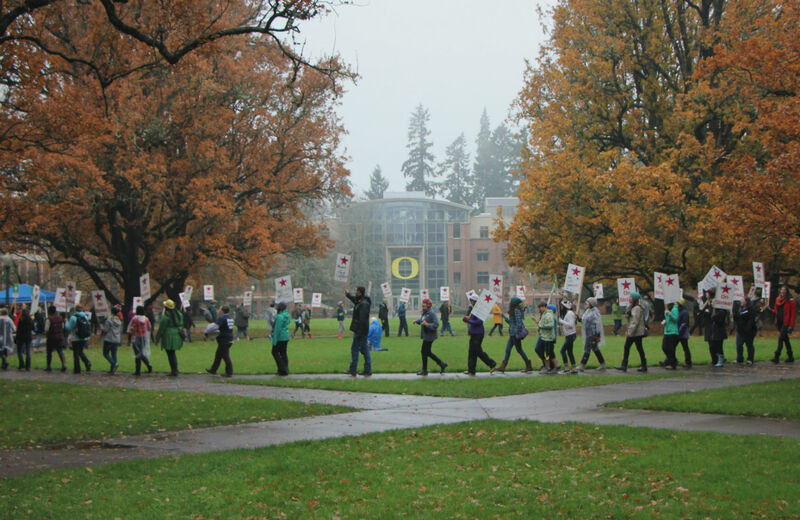 That’s why the Oregon teaching fellows’ strike demands resonated beyond the campus grounds. They represented a generation of academics who seek enlightenment outside the classroom, through class consciousness.